Here in Quincy, school starts next week. I can’t believe it’s that time of year already. These kids are ready to rock the ballroom. That also means that at QCT, we’ve reached the end of our summer programming. Last week was our Triple Threat Boot Camp —- the biggest education project of the year. At Boot Camp, students put in an intense week of classes and rehearsals, culminating in a showcase performance on Saturday. This year, we had a total of 77 students working together to prepare a showcase of material from Golden Age musicals. Truly, it’s amazing to see what these kids can create in just five days. I already knew that my students are amazing, but Boot Camp shows me that they are capable of anything they choose. 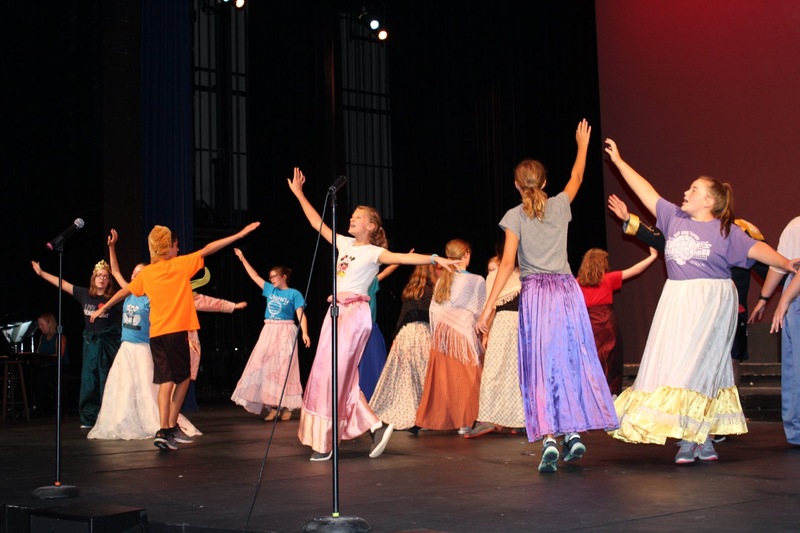 – our junior high group learned how to WALTZ! – the musical stylings of our live band: thanks Hedy Rothfuss and Steve Atchison! – excellent lessons and direction from guest instructors Megan Miller-Masterman, Erin Lafferty, and Paige Mueller. So what’s next for me? Of course, I’m right back in the saddle prepping for all of the education/student theatre events coming this fall. I start teaching outreach workshops right away – I’ll be visiting lots of local schools, but I’m particularly excited that this fall we’re offering a drama class as part of John Wood Community College’s College for Life program. Auditions for The Witches will start September 4-5. I’ve got a wonderful creative team working on this one – we’ve been working on some of the details for the special effects, and I can tell you that fans of the Roald Dahl book will not be disappointed. Fall classes are going to start in November, but registration will be open on the QCT website starting August 20th! Never a dull moment at QCT. Looking forward to an eventful fall! Enter your email address to subscribe to KelseyCelek.com and receive notifications of new posts by e-mail. Got a question? To reach me, click on my photo and fill out the contact form. Thanks!